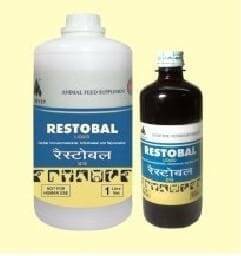 Solution: Restobal is a potent combination of standardized herbal ingredients , effectively fights stress through better adaptation , on resulting in improved specific and non-specific immune functions & performance. As a general heath tonic - Improves survival, Proper growth and Timely maturity. Peak lactation - Yields Better productivity. General heath tonic - Less disease incidences. Improves vitality in Bulls Improves libido and fertility index. With antibiotic therapy, Speedy recovery and Faster restoration of health and productivity. Administer the recommended dose twice daily for at least 5-10 days or as recommended by the veterinarian.